I've been stocking up. Now I shall share. After I shared the link to the 1st batch, this was Teh German's response. Teh German (tG): It's Coolray! I touched him! I touched the ray!!! Teh Megan (tM): I never watched the Jackass movie. tG: We made our own jackass video. It's on VHS somewhere. tM: We'll be watching that when we travel back in time. tM: Sorry, I was pressing the button, but it wasn't pressing. While driving a car is coming towards us with bright lights. tG: Do you have on your high beams? tM: Maybe they had on their high beams because they are like a streak of lightning. tG: Maybe like a streak of douchary. When we were on our way to Germany, I got a massive zit on my cheek. tM: OMG this zit is so big. tG: You should apply for another zipcode. tG: A gentleman doesn't have to pay money to have women hang out with him. tG: Like rrrrraaaiiiiinnnn hmmmm hmmmm hmmmm hmmmmmmmmmmm.. What is this song called? Rain? 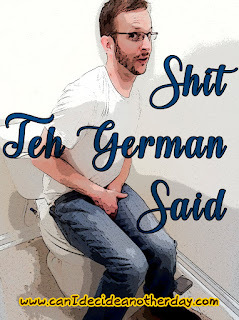 *song was Ironic by Alanis Morissette if you didn't figure it out from Teh German's rendition. Ah, couples banter - always makes me laugh. I'm also proud I knew he was singing Ironic based on what you wrote! I legit listened to Ironic this morning on my way to work. Too funny. Zipcode...lol. I want to hang out with you two lol. Fave = "It wasn't impressed". I feel like we need more of these conversations. Because I about laughed myself sick over "it wasn't impressed?"